Social Determinants of Health: A Comparative Approach introduces the various elements that determine the health of individuals in their communities. The text takes a macro-level approach, focusing on population health rather than strictly on individual health. 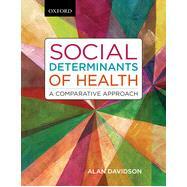 Social Determinants of Health focuses on "Anglo-American" countries-Canada, the United States, the United Kingdom, and Australia-examining the commonalities and differences socially, economically, and politically. The text begins by outlining the background, theory, and evidence for a population health perspective. This is followed by discussion of environmental factors, such as employment, housing, and diet, and social factors such as gender, support and well-being, and being an Aboriginal person. The text concludes with an overview of the social patterning of health-relevant behaviour and the politics of health-related policy. Written in an accessible manner, Social Determinants of Health further engages students by offering case studies and "Pause and Reflect" boxes, as well as end-of-chapter questions, suggested readings, and websites. Alan Davidson is an associate professor in the School of Health and Exercise Sciences at the University of British Columbia Okanagan. He has served as the dean of the Faculty of Health and Social Development at Okanagan University College, director of the Population and Health Services Research Centre, and director of Health Services for the Yukon government. The Emergence of the Field "Social Epidemiology"
What Are We to Make of the Literature on Inequality and Health? Lower Taxes or More Public Spending? Who Are the Aboriginal Peoples?